Seven No-Hitters! 5,714 Strikeouts! His records may stand forever! Sanford Holien's tribute to the Strike-Out King's legendary career. 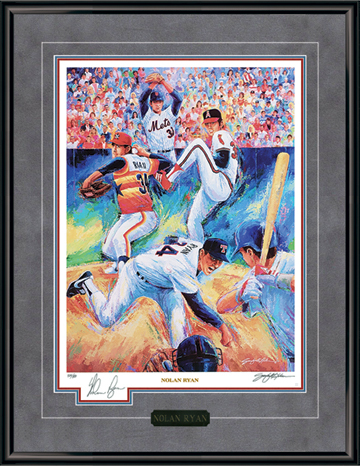 With a blazing 100 mph fastball and a work ethic like no other, Nolan Ryan dominated hitters for 27 unparalleled seasons on his way to an all-time record 5,714 strikeouts. During four decades of dominating prominence, he totaled 324 victories and a host of major league records. Most notable of his milestones are a mystifying seven no-hitters and 12 one-hitters. The eight-time All-Star fanned a record 383 batters in 1973, and his career strikeouts encompassed 1,176 different players. Edition size: 500 worldwide release, plus 50 Remarqued Artist Proofs.